San Francisco startup RocketOn, the company behind a virtual world platform that bares the same name, has more tricks up its sleeve and is today showing off the second product it created. The web application it’s introducing today is dubbed Blerp, and its ambition is to turn the Web into a giant interactive message board by making it possible for visitors to add text comments and multimedia to existing web pages and share them with their friends. Under the motto ‘layer the web!’, Blerp aims to enable people to enrich web pages with an additional layer of content with the ability to let others join in on the fun at any time. RocketOn is calling the concept Hyperlayers, and if the idea makes you think of social annotation services like Reframe It, Diigo or Fleck, that’s because it’s taking an extremely similar route with Blerp. The app basically creates a virtual space on top of websites that you visit in the form of a sidebar and a header, which allows you to post text, photos, videos and interactive elements like polls and ratings on top of the page while still being able to see and interact with it. Blerp users get a personal homepage dubbed My Stuff that gives them an overview of what’s being discussed by their friends online, and are able to jump right into the conversation from the interface. 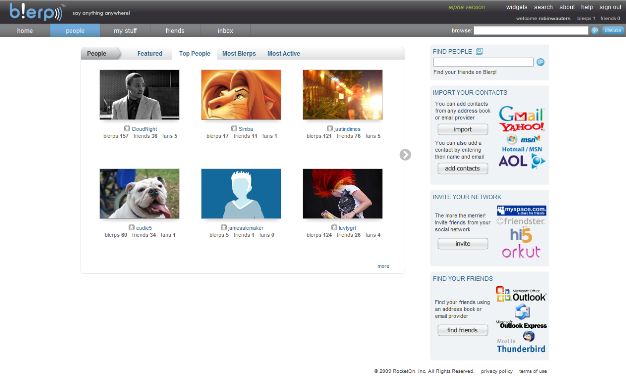 In Digg, or rather StumbleUpon fashion, users can ‘hype’ certain discussions to help it get featured on the Blerp homepage, with the extra ability to favorite (aka bookmark) live discussions and share them with friends by e-mail or through a variety of social networking services. There are two types of discussions: user-owned and community discussions. The former are created and controlled by specific users, while community discussions are created by the startup’s system and are not owned by anyone. 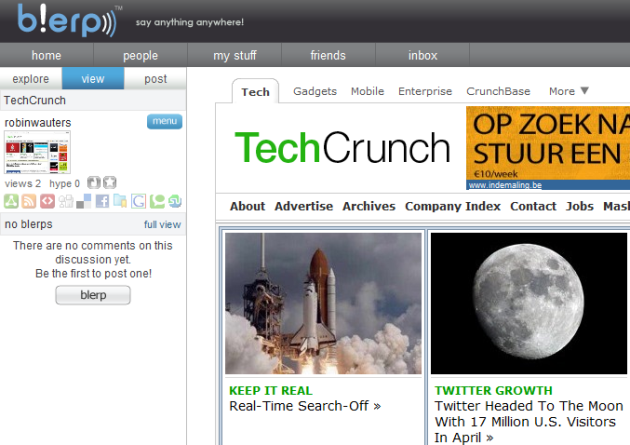 There’s a community discussion on every site Blerp users visit, and you can view one I started for TechCrunch here. I don’t see myself becoming a regular Blerp user any time soon, but the original idea seems to be well implemented. Note that the service is still in alpha mode, so expect to run into a few bugs here and there. RocketOn is backed by $5.8 million in venture capital (judging from the members on its board by Bertram Capital next to DE Shaw’s Venture Group whose investment in the company we covered earlier) and says it initially developed Blerp as a feature for its parallel virtual world but quickly realized that it could function as a stand-alone tool just as well. Time will tell if it was a sensible decision to make.